One of the best things about the Chicago "indie rock" scene is that it never fails to offer up a diverse, unpredictable mixture of sounds under that single generic label. Case in point: the hard-driving, grungey-yet-ultimately hard to pigeonhole rock of The Moses Gun, comprised of vocalist and guitarist Vell Mullens, bassist Rich Harris and drummer John Marszalek. Although the band have been a part of the Chicago music scene since the mid-90s, they've just this month released their official recorded debut, The Strobe Session, and are celebrating the release with upcoming gigs at Phyllis' Musical Inn (March 27), Double Door (April 27) and the RockBox (May 7). Download mp3: The Moses Gun - "Broken Neck"
WCR: To begin, give us a bit of background on The Moses Gun - how and when did the band come together, and how has it evolved over time? VM: Rich and I met on the far southeast side of Chicago in 1989 and immediately found common musical ground - Metallica, Depeche Mode, Husker Du, Hendrix, Rundgren, The Smiths, Zeppelin. We're both very guitar-oriented and share an appreciation of the challenges of getting heard and making a mark musically. The idea to form a musical entity occurred quite naturally. We adapted the name "The Moses Gun" in 1995 as we jammed along on rough early versions of our core songs with a Dr Rhythm drum machine in my coach house apartment at Crystal and Hoyne. Johnny had been on our radar since 2001 and when his previous band (Machete Monks) dissolved, he came on board in late summer 2007. Johnny is a very studied, regimented and expressive musician and a star of Proviso West's world-renowned marching band. His playing style really pushes things along, you know? After years of fits and starts, sidetracks and other projects that just weren't quite the right thing, we believe we have found the optimum lineup to bring our songs to life. We've accomplished more in the last two years than we had in the previous 12 largely because we have set definite goals for ourselves: create, record, promote, play, repeat. For people who haven't heard your music, how would you describe your sound? Lately it has become apparent that we're best described as grunge or Chicago-style post-punk. I personally am just coming out of a fuzzy period where I would self-consciously attach descriptive terms to our sound that just plain were not in my vocabulary five years ago. Indie rock? Avant-garde post punk? Indie garage? Heavy melodic noise rock? Grunge, after all the dust has settled, pretty much sums up what we’re going for. Dynamically-shifting heavier melodic rock music with guitar, bass, drums and vocals. I recall sitting straight up in bed out of a semiconscious state late one night in 1991 as I heard the opening chords of "Smells Like Teen Spirit" on XRT. As the track grew heavy I remember saying aloud to no one "That's it! That's what it's all about, right there!" Our lyrical content is both personal and spiritual. More focused on snapshots of time periods and states of mind than narrative statements about politics. Humanity feels most natural to write and sing about. You recently recorded an EP called The Strobe Session. Tell us about the recording process and some of the specific songs. If you could pick one song you most want people to hear, which would it be? Working - if you can call it that - with Jamie Wagner at Strobe Recording was an absolutely enjoyable, relaxed experience. We provided him and Kevin recordings we'd done at practices of the songs we wanted to include and he was prepared from day one to help us put them across in a way that best suited us. It's a very raw and live-sounding recording which was the goal from the outset, but it also takes you to some different levels within that live house. I mean, you don't spend the entire recording in one sonic mindset, you know? Since taking a journey through our entire sonic "house" was one of the main goals of the recording, I would pick "Broken Neck" as the track from The Strobe Session which best exemplifies what we were aiming for. From concept to performance, I think it really stands out and it's got that wicked beat you can bop your head to. What do you think sets The Moses Gun apart from other indie rock bands in the city, or other indie rock bands in general? Our most important distinguishing feature? We’re in touch our inner grunginess! We won't quit on you (If we were going to, don't you think we would have already? ), we oppose exclusion and support inclusion, we recognize the genius of Falstaff I and II, and ultimately we realize that there are more important things than our recordings, performances and musical aspirations (it ain't brain surgery), but we readily disregard that fact when it’s time to perform. Every performance is like a plea - we want the party to grow in size - to find more fans who experience us and say "yeah, that's it! I like the way The Moses Gun makes me feel!" 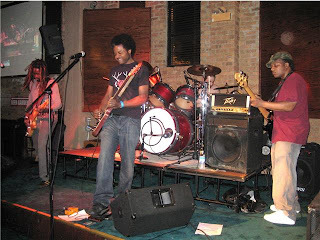 How has living and making music in Chicago impacted the band's sound and overall approach? Chicago makes you really measure your desire and decide whether you honestly believe in what you’re doing. There are and have always been lots of places to show what you can do in this town, but if you're thin-skinned or expecting super-fast success without effort and commitment you can get real discouraged real quick. This is a big pond and you have to do what you do because you genuinely enjoy it. Otherwise, it can crush you. What can people expect from a Moses Gun live show? Frenetic raw power and real emotion. By the time we get to the stage, we're ready to release some frustration and eager to prove that we belong, that our music is worthwhile. We kinda have a chip on our shoulder, but are more than willing to bust our asses to entertain and to try to share what we hear in our music. And at some point, Johnny will take off his shirt pretty much guaranteed. And there will be beer, Negra Modelo if available. We're promoting and playing shows to support The Strobe Session, trying to get it reviewed, on the radio, picked up for distribution, used on video game soundtracks, episodes of "Grey's Anatomy," etc. March 27 we're at Phyllis', April 27 we're at Double Door and then on May 7 we'll be live with Razor and Die on WLUW 88.7, and that night we're playing The RockBox on Lincoln Avenue. We'll probably ease up on the local shows after that although we've thrown our hat into the ring to rock some street festivals and college towns in IL and neighboring states. We're also being considered for a couple of compilations and plan to record more, and will be releasing at least another single before the end of summer. The Ambush 210 demo we're currently making available at our shows contains six songs which will most likely be included. We think The Moses Gun would be a great addition to the right indie label's roster. We would like to get some help with realizing our goals, but we realize that you really have to do everything you possibly can for yourself and if interest comes, you can accept help or deny it on your terms. With distribution services like Tunecore and CD Baby, there's nothing stopping performers from putting themselves out there if they believe in what they're doing. It's a great time for us right now and we’re committed to keeping the momentum going.